/ Modified jun 6, 2016 3:09 p.m. 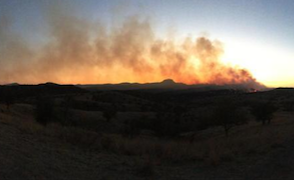 Hot and dry weather has contributed to spread of a grassland fire southeast of Arivaca near the Mexican border, and the fire has burned 8,500 acres, Coronado National Forest officials reported Monday. Mule Ridge Fire, near Arivaca, June 6, 2016. The Mule Ridge Fire was 50 percent contained on national forest land Monday, officials said. It was spreading slowly. Hotshot crews were among the firefighters brought in to battle the blaze, which has been burning one week. No structures were threatened, and the fire cause was under investigation.